For Amber Vega, every day brings new challenges as a registered nurse at the emergency room in Harlingen Medical Center. But as an alumnus from three TSTC nursing programs, the 25-year-old said she is more than ready to handle what comes her way. The Harlingen native followed in the footsteps of her mother, brother and many other family members who have pursued a career in the medical field. Vega graduated from the Nursing Assistant program in 2012 when it was still offered at TSTC, and also from the college’s Vocational Nursing and Registered Nursing programs in 2015 and 2018, respectively. She had a number of nursing schools she could have chosen, but Vega decided on TSTC because of its proximity to home, affordability, length of program and class size. She added that pursuing a two-year degree also saved her and her family money, leaving them debt free. TSTC’s registered nursing program takes approximately 20 months, or two years to complete and costs around $12,300. According to the Nurse Journal, a worldwide social community for nurses, on average a bachelor of science in nursing takes nearly four years to complete and can cost on average anywhere between $40,000 to $65,000. “It’s great not owing any money and saving what I’m earning to make a better life for myself,” she said. 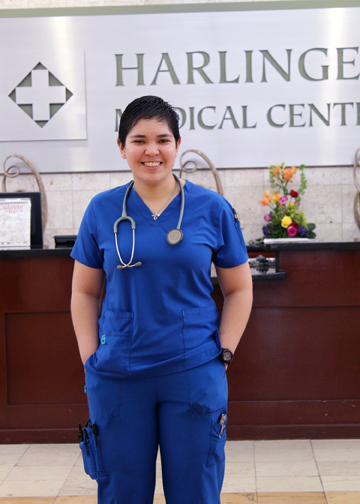 Vega said nursing has changed her perspective on life, decision making and leadership; and it all started when she began her clinical rotations at Harlingen Medical Center. It was also here where her skills were recognized and she immediately hired after passing her National Council Licensure Examination (NCLEX). She also said she is happy and relieved that TSTC has helped her find success in such a short period of time. Vega said she does hope to follow in her brother’s and mother’s footsteps and eventually become a nurse practitioner. Nursing is also offered at TSTC’s Breckenridge and Sweetwater campuses. For more information on the vocational nurse to registered nursing transition program at TSTC, visit tstc.edu/program/nursing or call 956-364-4983. Information sessions are now being held twice a month through August 2019.